Disney World celebrates Halloween in a big way each year with Mickey's Not So Scary Halloween Party on special nights in September and October. 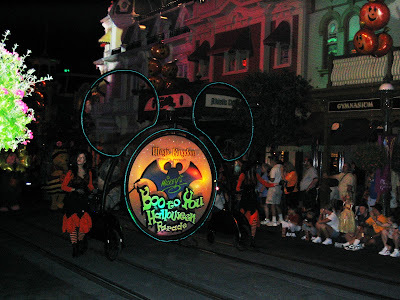 For 2010, MNSSHP will be held on 24 different nights, so there is no excuse not to be there! Mickey's Not So Scary Halloween Party nights are: Sept. 14, 18, 21, 23, 25, 28, 30; Oct. 1, 3, 7, 8, 11, 12, 14, 17, 19, 21, 22, 24, 26, 28, 29, 31; and Nov. 1. This is one party where ALL Disney guests are encouraged to dress up. You don't have to wear a costume to attend the party, but it is part of the fun. You will see whole families in costume, even the adults! Note: Disney World does reserve the right to determine that a costume may not be appropriate and ask a guest to modify or change. This is also the one event where Disney does allow guests to wear masks, but eyes must be visible. The MNSSHP runs from 7 p.m.-to-12 midnight. (You may enter the Magic Kingdom at 4:00 pm with your event ticket.) The special "Mickey's Boo-to-You Halloween Parade," that is not to be missed, takes place at 8:15 and again 10:30 p.m. Tip: The 2nd parade is always less crowded and you will be able to get a better view. Also attraction lines will be shorter during the 1st parade. The special “Happy HalloWishes” fireworks spectacular is at 9:30 p.m. All of these special events put a special Halloween twist on your typical Magic Kingdom experience. Even your favorite characters will be in costume. During the MNSSHP most of the rides and attraction at the Magic Kingdom are open, so make sure that whatever costume you decide to wear is easy to move around in, and can make it on and off of the attractions. In addition to the attractions, there is trick-or-treating, meet and greets with characters and entertainment unique to Mickey’s Not-So-Scary Halloween Party. This is a fun Halloween event and like the name indicates, it is not scary and is suitable for all ages. Note: You will probably see more of the Disney Villians than normal, in case your young ones are afraid of them. Prices are $59.95 (ages 10+) and $53.95 (ages 3-9) for all dates except Oct. 29 and Oct. 31 when tickets cost $64.95 (ages 10+) and $58.95 (ages 3-9). Advance purchase (prior to event day) savings of $6 per ticket are available for the parties on Sept. 14, 18, 21, 23, 25, 28, 30; Oct. 1, 3, 7, 11, 12, 14, 17, 19, 21, 24, 26; and Nov. 1. There are also additional advance purchase discounts available on select nights for DVC Members and Annual Passholders. If you are one of these please check the DVC or AP website for more details. Additional information is available at www.disneyworld.com/halloween. Tickets may be purchased online or by calling 407/W-DISNEY. 1 comments to "Mickey's Not So Scary Halloween Party At The Magic Kingdom"
Both of Disney's special parties offer a great chance to see the park in a whole new light. It's great to see all the kids dressed up and trick or treating in THE MAGIC KINGDOM.